J.M. 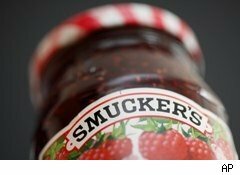 Smucker (SJM) reported Friday its fiscal first-quarter earnings rose 5%, even as sales inched lower compared with the same period a year ago on slightly improving profit margins. The No. 1 jam maker in the U.S. earned $102.9 million, or 86 cents a share, in its fiscal first-quarter 2011, up from $98.1 million, or 83 cents a share, in the year-ago period. Excluding items, Smucker earned $1.04 per share, topping analysts' estimates of 96 cents a share, according to Thomson Reuters. Quarterly sales declined slightly by $4 million to $1.05 billion, below expectations of $1.07 billion. The food-services company said impact of favorable foreign exchange rates and sales mix offset the impact of the potato business divestiture and an overall 3% decline in volume. The volume decline was driven by the oils and baking brands in the U.S. and Canada. The company's U.S. retail coffee sales rose 7%, while consumer sales fell 4% and oils and baking sales dropped 11%. The company said it achieved volume gains in Folgers and Dunkin' Donuts brand coffee, Jif peanut butter, Hungry Jack pancake mixes and syrups, and beverages in natural foods. "We are pleased to once again deliver strong quarterly results in this economic environment," commented Chairman and co-CEO Tim Smucker. "We continue to invest in our iconic brands and in product and operational innovations that will drive growth today and long into the future." Executive Chairman and co-CEO Richard Smucker added, "While we are in a challenging marketplace, our ability to successfully manage our way through is reflected in our consistent performance. Our business is solid, our brands are strong, and we continue to be well poised for the future. We are confident in reaffirming our earnings outlook for the fiscal year." The family-run company slightly increased its outlook. For fiscal 2011, it now expects net sales to increase slightly ahead of the 3% growth originally expected, primarily due to the impact of recent pricing actions. Analysts expect sales of $4.75 billion. Adjusted income per share is expected to range between $4.50 and $4.60, in line with the original estimates. Analyst consensus estimates call for earnings of $4.55 per share. The company has been on a buying spree the past decade, snapping up such brands as Jif, Crisco, Pillsbury, Hungry Jack, and most recently, Folger's. This strategy helped sales swell from $632 million in fiscal year 2000 to $4.6 billion in 2010. Year-to-date, SJM shares have declined 6%.